Click here to revisit some previously posted pictures of it. Did you correctly identify the mystery food in yesterday's Daily Farm Photo? Click here to find out. Oh I love the picture! It looks so inviting. Great shot! Wonder if Cary would like to swing. you'll have to find someone else. My husband grew up on a farm and misses the country life each and every day. Your blog and photos are most lovely! I see you are still having trouble with your dial-up connection. If by chance you have AOL they will sometimes send out a free modem that fixes that problem. Just give them a call. I enjoy viewing your country-time farm photos, etc. Keep it happening, it's great. Myself (ex Penna, dairy-farm lad, before the era of bulk-tanks and pickup), I can understand and sympathize with it all. That's a gorgeous picture. It reminds me of where I grew up, rural southwest Kansas. We didn't have a swing, but we had a tire swing. It used to be in this sunken area, and when it rained, the area just underneath the tire swing would fill with water. It was fun to stick your feet out and blow through it! I've got a tree swing, but it's a whole bench. Room enough for a laptop and the dog, I post from there often. I love the picture -- not just the swing, but the depth of the entire shot. If you ever publish a coffee-table style book of your daily farm photos, I'd buy it! What a great picture! It sort of implies a sad loneliness? The above is a message from my Isis. Who apparently wanted to tell you that she wants to sit on the swing. I'm still waiting for that photo of you in the long cotton dress and straw hat on this swing. I'm sure my patience will be rewarded eventually! 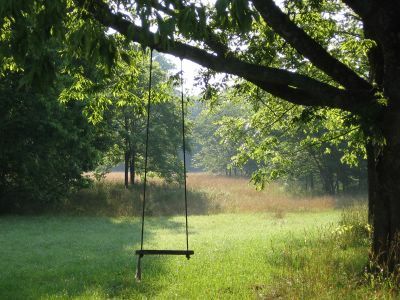 You make me miss my swing from childhood. It didn't have such a beautiful view...mine was more of the sidewalk and the neighboring road, but the feeling of happiness was just the same! Gorgeous pic.